What we have for you today is yet another guide on wedding jewellery. Especially at an Indian wedding, any bridal outfit is incomplete without the right kind of jewellery. And if you’re not the one fretting over which diamonds you should go for or what stone suits you best, your mother certainly is. Bottom-line is, with all the green that gets blown in the process of finding the right kind of bling, this happens to one of those wedding things that you simply need to nail! So go on, move to the next para already. You don’t want to keep her waiting! Protection against lethal substances. Expels evil spirits. Provides energy. Changes colour if wearer is in bad health. Brings about enlightenment and increases devotion. Gives strength to the heart. Protection against poisonous insects and reptiles. Heals stings and bites. Is said to pale if the wearer is faced with deception. Ensures a successful love life. The wearer also gains confidence, feels energetic and is active. Cures diseases, increases memory power and protects against evil spirits. Substitute for Ruby. Regulates circulatory system, gives strength to heart and boosts immunity. Prevents fear, stress, black magic and nightmares. Also creates awareness and boosts memory. Of course, these are just speculations from the incredibly auspicious Indian take on astrological history and may or may not be relevant, depending on your personal level of belief or disbelief. Anyhoo! We’ve done our part and given you the statistics. Whatever floats one’s boat, right? 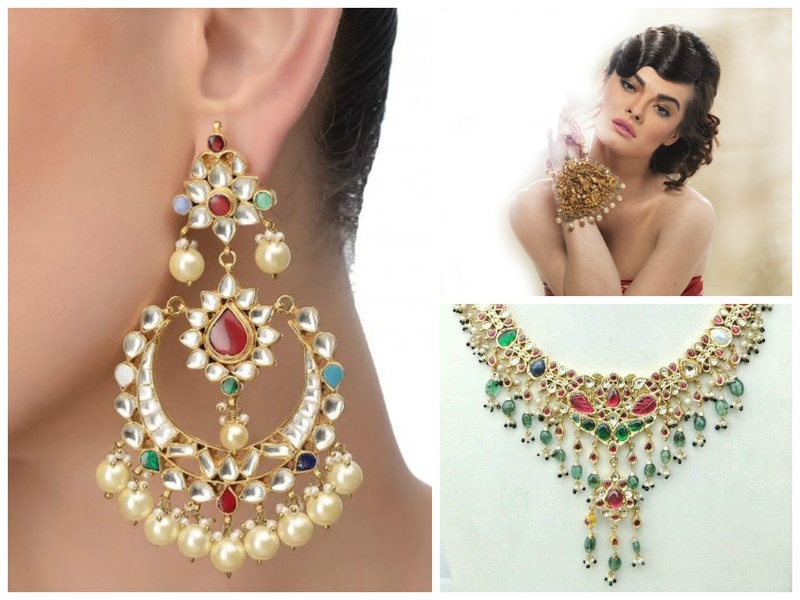 Coming to how much you’d have to shell out for these beautiful babies… the price range could differ on how much gold is used for the base and how many other stones are used to further embellish the piece, but approximately, a Navratna ring or earring would cost you around 10,000 – 60,000. Based on those figures, an entire bridal set would cost you somewhere between 1.5 – 4 lakhs. Navratna jewellery can be easily bought at any popular store like Navrathan jewellers,Tanishq or Amrapali. If you don’t want to move from your comfort zone, it is also available online, just like everything else nowadays! Though, we’d advise you to personally make the trip and check out which ones would flatter you. After all, they will make your wedding look! Take a look at our visuals for a more detailed idea on Navratna jewellery!